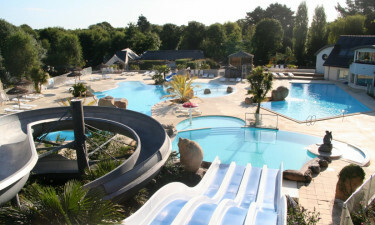 Les Deux Fontaines luxury camping site is situated along the coastal resort of Nevez, in Brittany, North-Western France. A typical Breton parc with everything at your fingertips, it's a popular second home for holidaying families. The site is a short walk from a beautiful sandy beach and comes fully equipped with all modern conveniences. Guests will fall in love with its surrounding harbours and scenic views. To book your bungalow tent or mobile home accommodation, get in touch with LUX-camp today. What's there to love about Les Deux Fontaines camping holiday resort? Deluxe five-pool complex suitable for all family members. Onsite spa and relaxation area. Multitude of activities onsite and in local tourist hotspots. Les Deux Fontaines offers luxury camping facilities and the 5 pool complex is just one of them. There are both indoor and outdoor lagoons, some covered and heated, and there's also a smaller pond designated for younger ones to play in. The family will really enjoy the two slide features one of which has four lanes. If you fancy a change in scenery you can take advantage of the lovely, long sandy beach which is accessible from the camp and only 0.9km away. There are plenty of sports activities on the beach and you can even organize a spot of scuba-diving. Pont-Aven is also known as the artist’s town. Many painters have resided in this picturesque haven and it's easy to see why. There's a decidedly relaxed and tranquil atmosphere with an easy-going pace of life. There are lovely guided tours along the riverbanks which point out the homes of many famous artists. The town also boasts an impressive variety of shops and galleries, so why not take a leisurely stroll around or sit outside one of the little bars while you soak up the typical sunny climes. 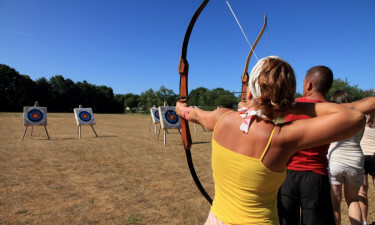 Guests at Les Deux Fontaines camping site might be hard pressed to leave their luxury tent or mobile home, but there's loads of things to do on the site itself. There's a games room plus tennis and basketball courts, and if you fancy some footy, there's also a pitch. The onsite gym is a good choice for keep fit enthusiasts, and golf fans don't have far to go for a game. A lovely way to view the surrounding areas is by pony-ride and the children will really enjoy it with you. Les Deux Fontaines holiday resort doesn't have an onsite restaurant but they do provide a take-away service for your convenience. There's also a lively bar where you can sip on a glass of wine and have an ice-cold beer. Les Deux Fontaines has a mini-market fully stocked to cater for your camping essentials; fresh bread and pastries, fruit, veg and groceries. This is truly camping with the luxury of convenience, too.